Product prices and availability are accurate as of 2019-04-12 04:03:52 EDT and are subject to change. Any price and availability information displayed on http://www.amazon.com/ at the time of purchase will apply to the purchase of this product. The WOOBAMBOO SLIM Handle was designed to be sleeker and thinner, with a slightly more compact head size. Organically grown, Nontoxic, and BPA Free! Packaged from Recycled Materials! Highest Quality Dupont Tynex Bristles! 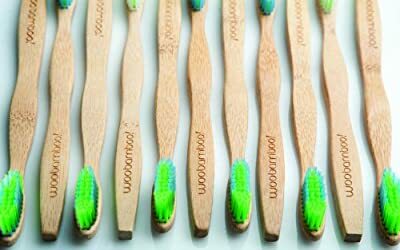 Biodegradable Brush Handle! Panda-friendly, too!